Factary’s New Trust Update was first launched in 1993. It was the first service of its kind, allowing subscribers to become aware of any relevant grant-makers in the weeks following their registration, before they get swamped by applications or listed on any other directory. Since then we have published over 285 issues – and sought to constantly improve the service, providing even more value for our non-profit subscribers. In 2015 we launched our new online Archive database, utilising our extensive back catalogue by making all past issues since 2005 available online and all featured trusts searchable by charitable area of interests, keywords or trustee name. As of February 2019, the number of trusts on the database is over 3,200 and growing every month. Now, we have made yet another development that radically improves the functionality and utility of this already valuable resource. Using data from the Charity Commission, we have been able to add the latest total charitable expenditure figures to all trusts on the Archive. This means the data is no longer just a historical snapshot from the original time of research, but now contains up-to-date financial information allowing subscribers to have a ready indication of the size of each trust and likely grant capacity. As well as adding expenditure figures, we have been able to update the status of all the trusts and foundations on the Archive register. This allows subscribers to see whether a trust is active, recently registered, not financially active (no accounts submitted for the past five years) or whether it has been removed from the Charity Commission register. Overall we found that only 13% of the entire dataset has been removed from the Charity Commission register, and a further 2% are classified as financially inactive. As you would expect, as time goes on more and more trusts are removed from the register and within 9 years this reaches a rate of around 1 in 5. By 14 years it is up to around 1 in 4 that have been removed from the Charity Commission. What is also interesting is that some trusts and foundations appear to be removed within two years of registration. The reasons for these early removals is not clear, but by having these classifications available in the Archive database, subscribers are able to see which trusts are active and which are not, and exclude them from their search results. Excluding those that have been removed from the register, over 30% of the trusts and foundations on the database had a total expenditure of over £100,000 in the last financial year. There are a total of 160 trusts and foundations on the database with a recorded expenditure in excess of £1m in the last financial year. Over 85% of the trusts and foundations on the database are still registered and financially active. When we look at the recorded activity types for those with an expenditure of over £100,000, we see that there is a high proportion of those supporting Health, Education and Welfare & Poverty, as well as a substantial number listed with general charitable purposes at the time of registration. All activity types are represented in this high-value dataset, meaning it will be of use to non-profits working in all sectors. What’s even more interesting, is when we compared our dataset to the trusts and foundations held on the Directory of Social Change’s Trustfunding resource. 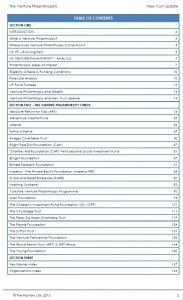 What we found was that only 20% of the trusts and foundations on our Archive database are listed on Trustfunding – so the New Trust Update Archive holds details of over 2,500 trusts and foundations that are not on the leading directory, including nearly 500 that have a latest expenditure of over £100,000. This new development makes the New Trust Update Archive database an invaluable resource for non-profits seeking to raise income from trusts and foundations. It contains records on a wealth of trusts and foundations that do not appear on any other major directory and is now searchable by both activity type and expenditure level, making it a brilliant resource for building lists of potential donors. So as a subscriber to New Trust Update, not only do you get the opportunity to start building relationships with new philanthropic vehicles before anyone else, you also get to draw on the vast pool of grant-makers, not widely known to other non-profits. If you would like to find out more about New Trust Update please contact Nicola Williams or call 0117 9166740. Q: Where can you find more than 9,000 philanthropists who took the brave and often complicated step of creating a new grant-making charitable trust (a ‘foundation’ in international terminology)? A: In Factary’s new New Trust Update Archive. The new NTU Archive is many things. It’s a simple, fast and efficient way to find trusts and foundations in the UK. It’s a great way of finding out about philanthropists, and it is a history of the last ten years of philanthropy in the UK. Factary began recording the new wave of philanthropy back in 1993, when we noticed that the Charity Commission for England and Wales was experiencing a boom in trust registrations. We discovered that the registration documents for charities – which are in the public domain – contained information that allowed fundraisers to get a clearer idea of what the activities of new trusts, and who was behind them. This was not, at the start, an easy process. We had to take the train to Taunton (where the Charity Commission keeps part of its archive) and request, one by one, the registration documents for these new charities. We then had to go through each document by hand to pick out the charities that looked like they might be, or might become, grant-makers, and start the process of research. The second part of this process has not varied much over the years – we still carry out detailed research on each trust, contacting trust administrators and aiming to establish who is behind the trust, what their interests are, and what they hope to do. The Factary team moves fast on that research, and subscribers to New Trust Update (we limit the number of subscribers to 100) rely on us to be the first to hear about new grant-makers. The result is a rich database of more than 2,500 trusts with interests in arts, rights, women, older people, animals, the environment… the whole range of charitable activity. Users of the NTU Archive can search the entire data set using combinations of codes (for example, ‘Education and Training’) and keywords, to find trusts that were created with those interests. Users can research trustees by name. There are more than 9,000 trustees listed here, so this is a rich database on individual philanthropy – people who are concerned enough about a social or environmental issues to create a foundation or to join the board of a new foundation. 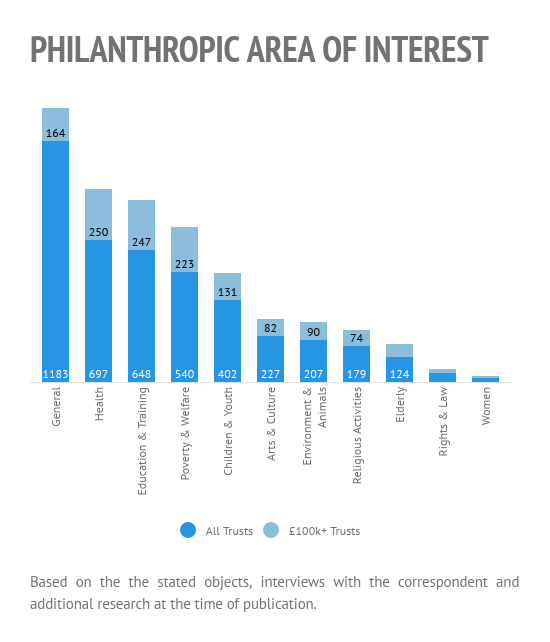 Information on philanthropy in the UK – with the honourable exception of Factary Phi – is hard to find and this data, linking people to their philanthropic interests is invaluable to the non-profit sector. Factary’s Will Whitefield emphasises that this is a record of the moment that the trust was created. ‘It’s like a birth photo of the trust. When we research the trust it is around a month or two old; so the trustees, objectives and finances are from those early days.’ But that in itself is valuable, because it allows a researcher to see who the baby was, and how it grew up. There are plenty of examples of this. The Bernard Sunley Charitable Foundation that we reported in June 2005 topped £4m in income in March 2015, double its spend at start-up. The Schroder Foundation, reported by us in March 2005 and created with a £10 deposit, had grown to £2.2m by April 2015 – that’s 22 million percent growth if you do the maths. But tracking less spectacular growth is also relevant. For example, a search using the keyword Africa throws up 167 trusts. Pick an early one, such as the Egmont Trust and compare it with the Charity Commission’s current record for the foundation you can see that founding trustees Clare Evans (who had worked with ActionAid in the 1990s) and Jeremy Evans are still in place, but that three others have joined (and two left) over the ten years since we reported its registration in our April 2005 edition. In here you will find the origins of venture philanthropy and impact investment. 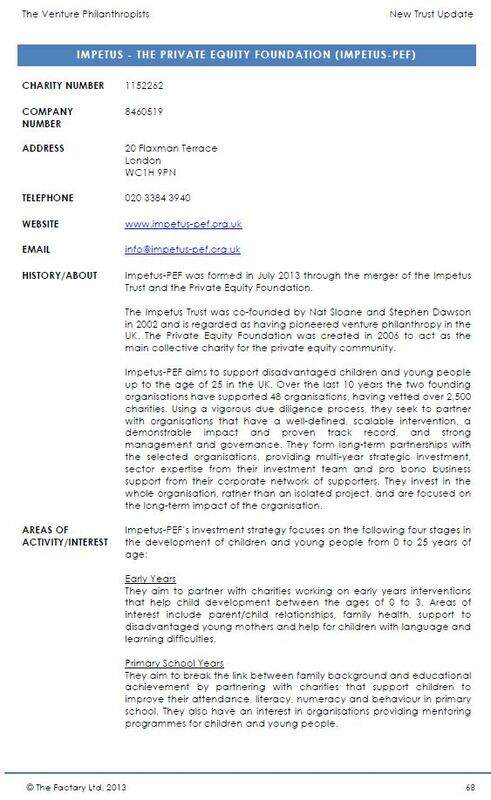 The Private Equity Foundation – we reported on it in November 2006 – is in there as is the moment in 2013 when it merged with Impetus to form Impetus Private Equity Foundation. The Apax Foundation – we reported its registration in March 2006 – is there too. Finally, there is all the great inventiveness of philanthropy here. There are foundations with names based on Beatles’ lyrics (“Love Is All We Need”, registered and reported in 2007), those with hopeful names (“The Making a Difference Foundation,” “Heaven Can Wait” or “The GoodFund”) and foundations from the UK’s vast pool of celebrities, from Gordan Ramsay, chef to the late Dan Maskell, tennis champion. Factary’s new NTU Archive is an open book on the growth of organised philanthropy in the UK. For more information just get in touch with Nicola Williams. Why so few women in UK foundations? We’ve analysed all of the newly created grant-making trusts (foundations) registered in England and Wales since 2005 – a data set of 2,312 new grant-makers. Our findings are in a new Factary report, ‘Trust Women’, available for download here. Boards are not balanced – on average there is just one woman per board across all of these trusts. Almost one third (29.7%) had all-men boards when they were registered. Just one trust in five has women in the majority on boards. And we found some evidence that trusts with women in the majority were poorer at start-up than those with men-majority boards. Our report is based on Factary’s New Trust Update dataset (http://factary.com/what-we-do/new-trust-update/ ). 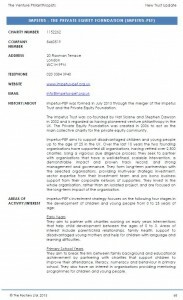 Thirty of the UK’s newest philanthropists are featured in a report published today by Factary. The report is focused on the Ultra High Net Worth Individuals (UHNWIs) and High Net Worth Individuals (HNWIs) who have founded grant-making trusts and foundations during 2013. We profile 30 of the richest people in the country who have created grant-making bodies, and analyse their wealth, philanthropic interests and biographical information to create a picture of the UK newest philanthropists. With a combined estimated wealth of £5.7 billion, these individuals represent a significant source of funding for UK non-profit organisations in the years to come. Networking Index to identify the links between philanthropists, companies and the new trusts. The report is priced at £135. New or existing subscribers to Factary Phi or Factary’s New Trust Update get a discounted price of £95. Included in the report is a scion of a billionaire family, a Duchess, a Viscount and two Knights of the Realm. There are eight representatives from the financial services industry including two hedge fund managers and four investment bankers, along with philanthropists with other sources of wealth including landownership, art galleries, bookmaking and football. 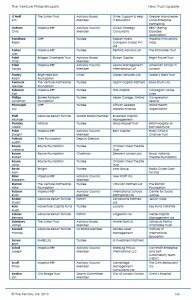 There is a strong geographic concentration on London and the Home Counties but also a continuing international flavour to the new philanthropists in the UK with seven of the thirty UHNWIs and HNWIs having nationalities other than British, and global connections identified to a wide range of countries including Zambia, South Africa, Italy, Nigeria and St Vincent and the Grenadines. There is a strong Oxbridge connection – a third of these new philanthropists went to either Oxford or Cambridge, with over 25% going to Oxford. Other UK universities attended include the University of Bristol, the London School of Economics, Leeds University and the University of Birmingham. Three of the people featured also went to the same public school; Charterhouse. During 2013 Factary’s New Trust Update reported on a total of 217 newly-registered grant-making trusts and foundations in the UK. This report shows that people of significant wealth are continuing to create foundations and grant-making trusts to support philanthropic organisations in the UK and abroad, creating a positive picture of philanthropy in the UK. The findings in this new report reflect the new philanthropists that we identified in our 2013 report on The Venture Philanthropists. In that report we found that 39% of UK venture philanthropists come from the financial services industry. We also found many people of wealth – £38 billion in combined personal assets. This report was researched and edited by Will Whitefield, Senior Researcher at Factary. It is published as a special supplement to Factary’s New Trust Update. 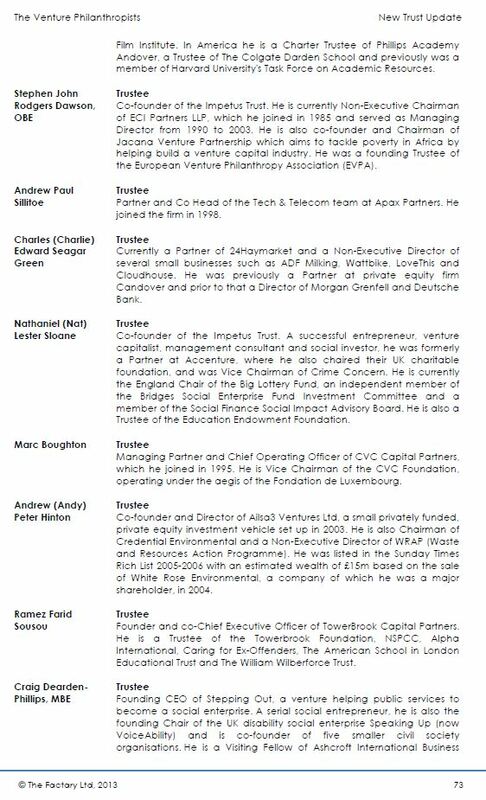 The focus of the report is the 254 board members and patrons who lead the UK venture philanthropy sector. We include biographies of each, and a handy networking index to identify who is linked to which fund. Many are people of wealth; we identify £38 billion in personal wealth. Subscribers to Factary’s New Trust Update or Factary Phi, or those taking out a subscription with the report: £150 per copy. To order a copy of the report contact Nicola Williams at Factary, nicolaw@factary.com or call Factary on +44 117 916 6740. We have just completed an in-depth study of the UK’s venture philanthropy sector – and it is all about growth. 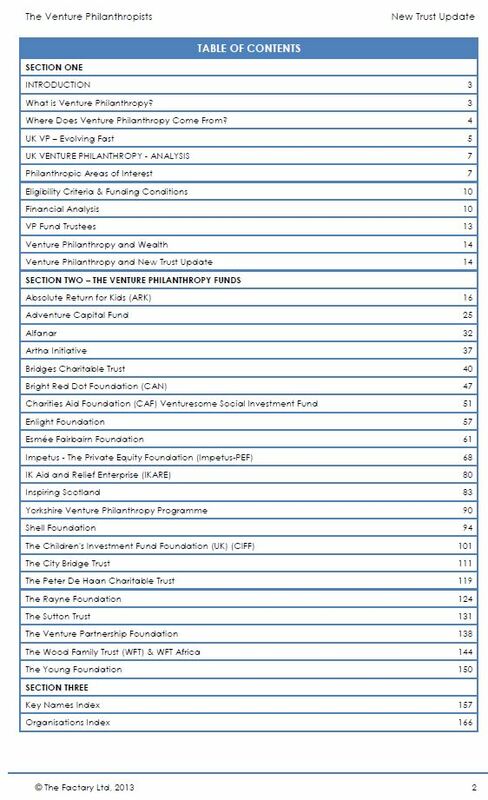 Two years ago we reported that there were 11 venture philanthropy organisations in the UK, giving (or investing, or lending) a total of £52 million. This year we have identified 22 organisations active in VP in the UK – double the 2011 number – with assets of £2.8 billion and income, at £274 million, up 171% on two years ago. The fastest growth area of all is in grants, loans and investments, up 221% on two years ago. 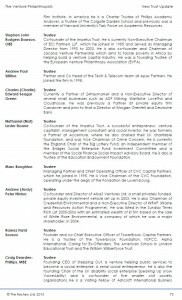 The report – The Venture Philanthropists – focuses on the 254 board members and patrons in the UK VP sector, including brief biographies of each. We include a Networking index that shows the links between VP supporters, companies and trusts or foundations. 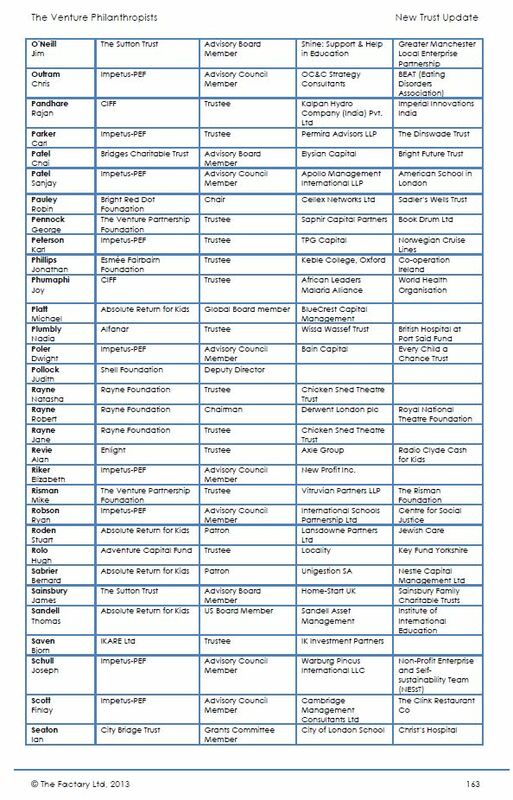 The report gives detailed information on each of the 22 venture philanthropy funds active in the UK. The 177-page report includes information on more than 150 charities and projects that have benefited from venture philanthropy. Subscribers to Factary’s New Trust Update, or those taking out a subscription with the report, £150 per copy. To order your copy contact Nicola Williams at Factary, nicolaw@factary.com or call us on +44 117 916 6740. More than 6,200 people have become trustees of new grant-making trusts in the UK since 2005. Who are these people? Our latest report – The New Trustees – includes these findings and more, and gives detailed data on these new philanthropists.